Low on McKinstry Ridge, looking up at Goman Ridge. Unheralded Goman Ridge deserves a little more attention as a viewpoint and hiking destination. 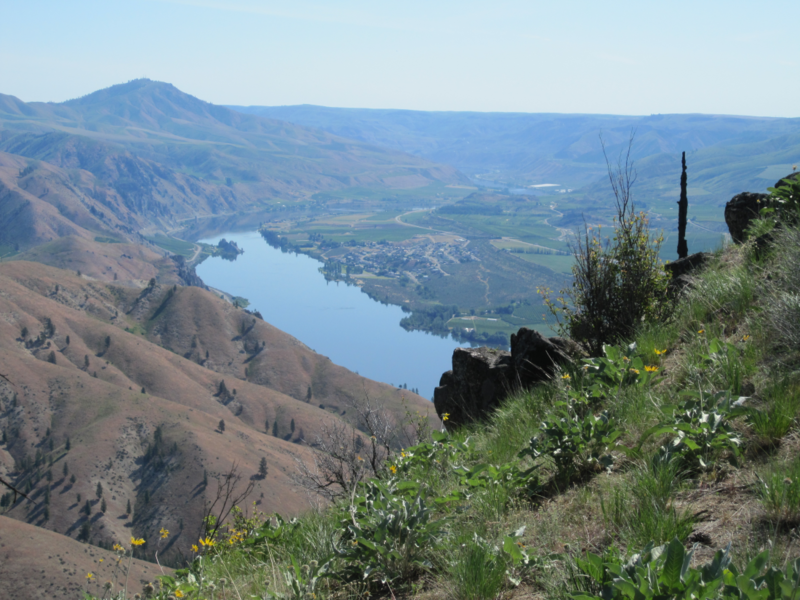 A bit north of Entiat, this north/south ridge separates tributaries of the Entiat River (Potato Creek and Mud Creek) from McKinstry and Byrd Canyons that drain east towards the Columbia River. Byrd Ridge and McKinstry Ridge (provisional names) provide scenic connections between Highway 97A and Goman Ridge. An on-line search indicates that the area gets occasional use from hikers. 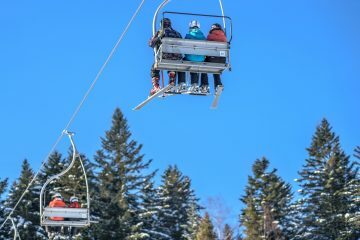 “Wildernessed” visits Goman Ridge periodically for winter/spring peakbagging: Eric Willhite documents the history of Forest Service presence in the area and located lookout sites at Byrd (Point 3625’) and Goman Peak (Point 3499’). A mile or so south of the now abandoned lookout sites, Point 3641’ is an open hillside with sweeping views in every direction. 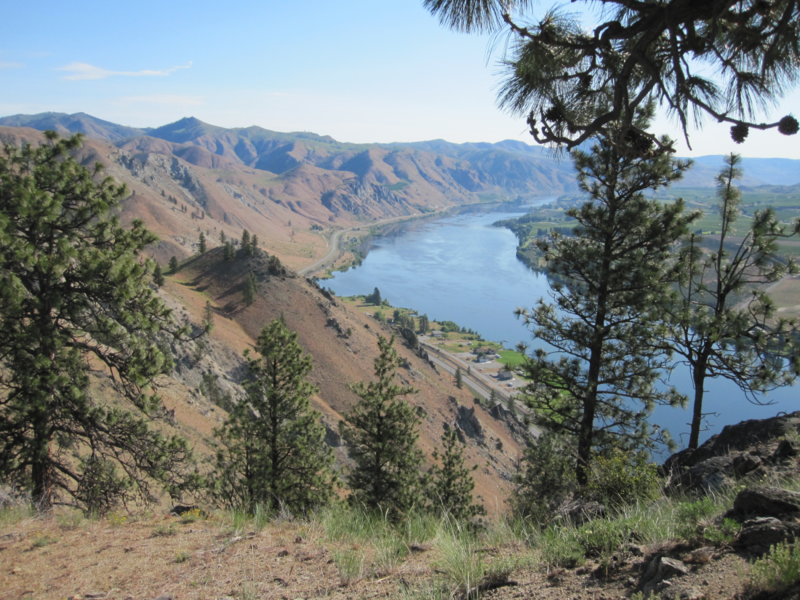 View of the Columbia River and Chelan Butte on McKinstry Ridge while ascending towards Goman Ridge. Many options for loops are available and I did a different combination than the hikes referenced above. In doing my loop, I completely circled the drainage of McKinstry Canyon, mostly along scenic ridges. I knew of a parking spot just off 97A at the base of Ribbon Mesa, a spot I had explored in depth years ago. My plan was to ascend to Goman Ridge via McKinstry Ridge and loop via a known route from Ribbon Mesa. McKinstry Ridge is the prominent ridge directly across the Columbia River from Brays Landing on Highway 97, a bit north of Daroga State Park. In order to reach the base of McKinstry Ridge I hiked the shoulder of Highway 97A northbound from my parking spot for a little over a mile. It’s a little unnerving to be walking along the highway with traffic coming at you at 60+ miles per hour. 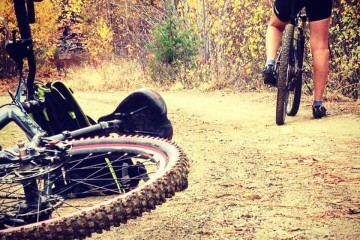 However, this section is flat, easy, and doesn’t take long. Once past the driveway for Ribbon Cliffs Orchard, ascend directly uphill towards Point 1682’. 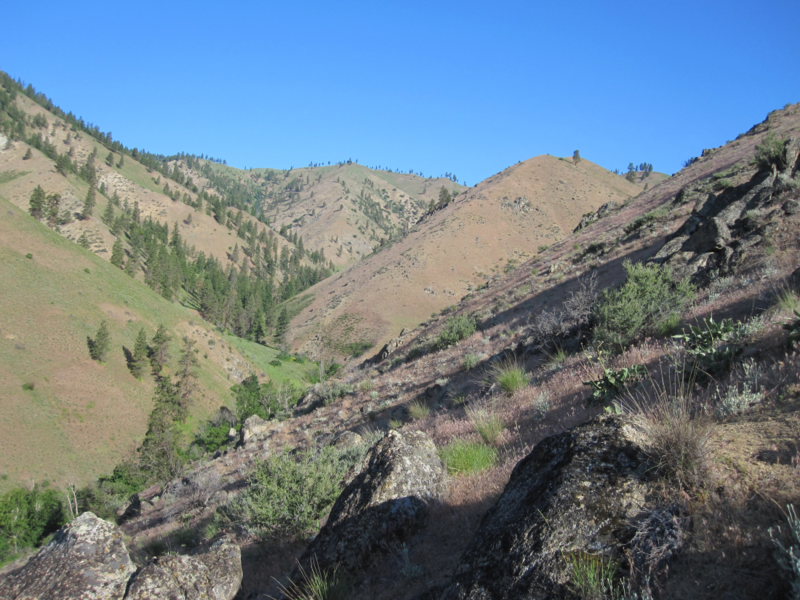 This is McKinstry Ridge and you can follow it all the way to Goman Ridge and nearby Point 3641’. The views just keep getting better the higher you ascend. 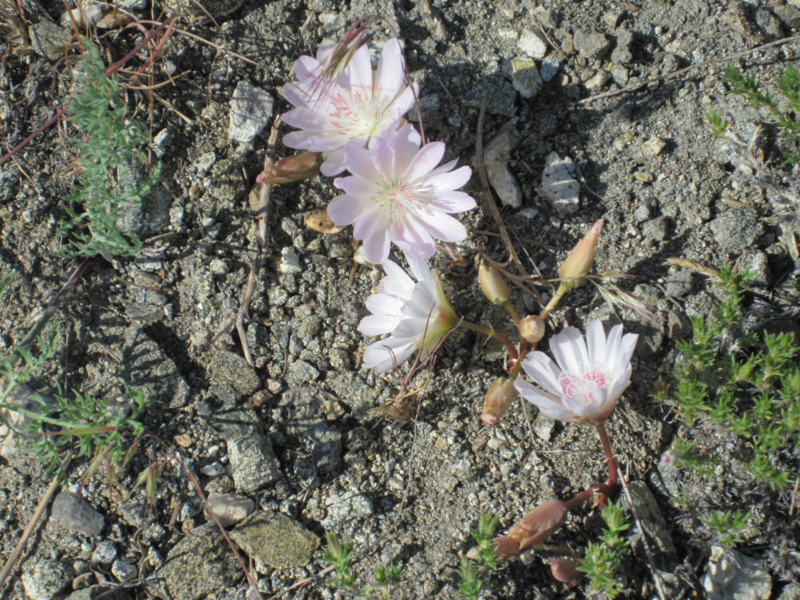 The bitterroot flowers on the south facing slopes were a real treat along the way. Where McKinstry Ridge meets Goman Ridge (a bit above Point 3344’), I was tempted with choices. There were several high points available heading north towards Oklahoma Gulch. Instead I headed towards nearby and attractive Point 3641’, deciding to do another loop on a different day to reach the high points between McKinstry Ridge and Oklahoma Gulch. High on McKinstry Ridge, looking upstream on the Columbia River. From the top of Point 3641’ a road system was reached that only required a short descent of about 100 feet elevation. I followed this road south and enjoyed the views and easy terrain, having been traveling cross-country for most of the morning. A spur that headed towards Point 2911’ got me to a point above Ribbon Mesa, then I resumed cross country travel for the descent back to my vehicle. To avoid being stuck above fences at the bottom of the route, move a bit south away from the orchard that is adjacent to Highway 97A. Maps. 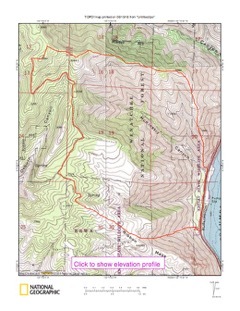 See the topo map below. Trip Report Created on 5-13-2016 by Charlie Hickenbottom.